Making shavings is definitely one of the most satisfying pastimes! Finding the shape that I know is inside the piece of wood I am turning, always gives me a thrill - to a non-woodturner, that might seem very sad! I love the feel of wood, the pattern of grain and the magic when you apply the finish - and the wood glows. 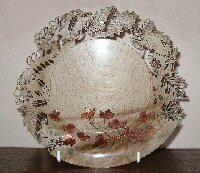 I have turned 'useful' items - but I enjoy the creative freedom I get when designing bowls and platters. I incorporate a variety of other craft techniques to make artistic pieces that I truly enjoy. I hope that you will browse my galleries and see the kind of work that I produce - and enjoy it too. I have written a few hints about how I achieve a certain result, but if you want to know more, please get in touch. I also enjoy talking to members of the public about turning and demonstrating to interested groups. 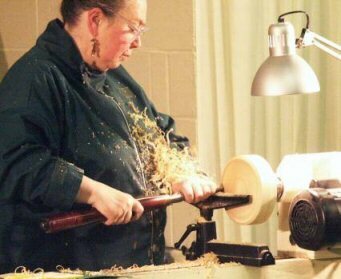 I am therefore happy to be invited to do demonstrations for clubs, take part in exhibitions, festivals and fetes (as long as power is available to run my lathe). Now that I have retired and my time is my own, I choose to support charities when I sell my work. I am happy to undertake commissions for the cost of the materials if a piece will be used for a charity, to raise money for a charity (raffle prizes etc.) or for a non-profit organisation.